Advertising and TV writer, Matt Heath, was bored, overworked and looking for something to do to stir up the interwebs for his personal amusement. So what better than to create a ridiculous Craig's List posting? 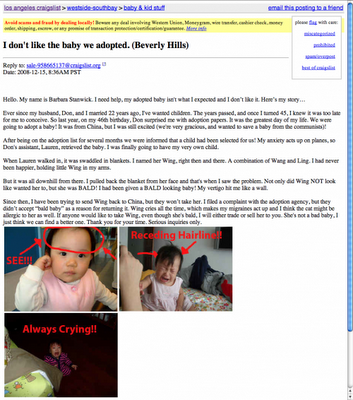 And when I say ridiculous, I mean he posted a sales ad posing as a shallow mom looking to sell the baby she just adopted from China because of her receding hairline. What ensued was massive outrage (some scary, some funny) from Craig's List users and a legit police investigation where they searched his home for illegally trafficked kids. Check out the drama here and learn what not to do from Matt.